How long does it take for a cup of tea to cool down? Or for a cup of coffee? The Newton's law of cooling calculator answers these kinds of questions. Reading the text below you will learn about the thermal conduction, the primary mechanism behind Newton's law of cooling. You will also find out what is Newton's law of cooling formula. There are 3 main mechanisms of heat exchange: thermal conduction, convection, and radiation. The Newton's law of cooling is best applicable when thermal conduction and convection are the leading processes of heat loss. An example is cooling of a cup of tea. In such cases, the primary exchange of heat happens at the surface between the liquid and air. The warm liquid evaporates, and convection drags it away from the cup, cooling the rest of the fluid. C [J/K] is the heat capacity. This formula for the cooling coefficient works best when convection is small. In fact, the heat transfer in convection depends on the temperature which makes this simple formula a bit less accurate. Here we assume that the heat transfer coefficient is constant. t [s] is the time of the cooling. For the applicability of Newton's law, it is important that the temperature of the object is roughly the same everywhere. This requires the Biot number to be small. 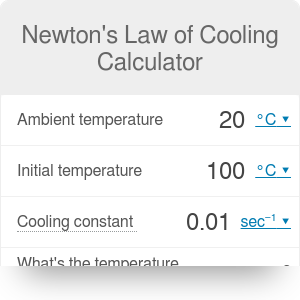 It is easy to apply Newton's law of cooling with our calculator. Just specify the initial temperature (let's say 100 °C), the ambient temperature (let's say 22 °C) and the cooling coefficient (for example 0.015 1/s) to find out that the temperature drops to 35 °C after 2 minutes. In the advanced mode you can enter the heat transfer coefficient, the heat capacity, and the area. Based on this information the calculator computes the cooling coefficient. Interested in warming things up instead of letting them cool down? Check then the Joule heating calculator. Newton's Law of Cooling Calculator can be embedded on your website to enrich the content you wrote and make it easier for your visitors to understand your message.